It's easy to believe that there's nothing your SMB can learn from brands like Coca-Cola or Apple. The way they do things is so completely different: budget, staff, objectives. These brands, they know what they're doing, right? I mean, it's clearly working. If we could implement their strategies, surely we could find some of the success they have. But can we? 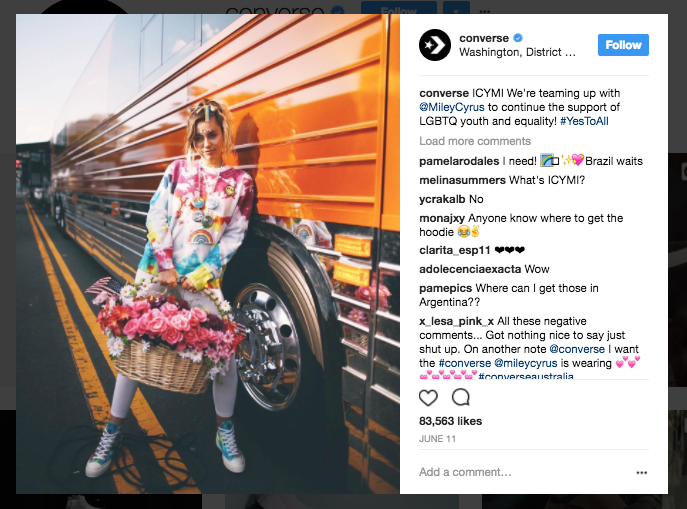 This article will explore the posts from Instagram's biggest brands and influencers, and give you actionable takeaways for those brands who don't have multi-million-dollar marketing budgets. Wishpond's Instagram hashtag contests are an awesome way for your business to grow on the platform (and drive people off it, and on to your website). Want to learn more about how they work? Click here to book a no-commitment, half-hour chat with a Wishpond rep! Let's start small, shall we? 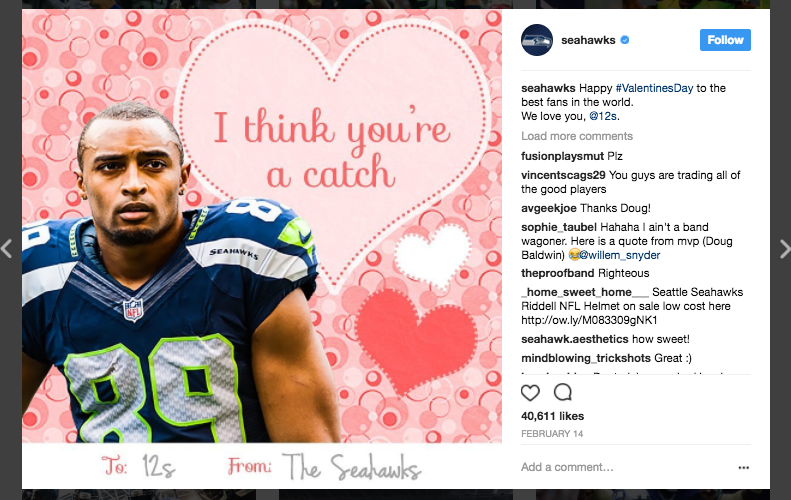 The Seahawks (incidentally, my team) have 2 million Instagram followers, and are one of the more active NFL franchises on the platform. Valentine's Day, the Fourth of July, Christmas, New Years, Easter, Halloween, Thanksgiving and St Patrick's day (the big 8) should frame your seasonal social media marketing campaigns. Instagram marketing success is often about two things: great images which tap into a larger conversation. Holidays are always and without fail, a big part of "what people are thinking about" which makes them perfect themes for your next successful Instagram post. Take a photo of your staff dressed up for Halloween or St Paddy's. This is also a great way to incorporate another Instagram best practice (going behind the scenes). Ask your Fans what's on their Christmas list, and feature your staff's top gifts or fondest memories. Coca-Cola is one of those brands whose marketing objectives seem to be so completely different from our own that we can't possibly learn anything from them. They're looking to retain their 130-year reputation, not build one. So, just for fun, what are they doing over there on their Instagram account? Don't be afraid to take yourself a little less seriously on social media than you might in your board meetings. Social media is social after all. The Big 8 holidays aren't the only holidays out there, and things like "#nationalcoffee/chocolate/pancake/dog/peanut-butter-day" might be just as likely to inspire engagement as Christmas, and more fun. Converse's instagram account is the pinnacle of "cool." They tap relationships with the coolest, most hipster of celebrities and their photos are always super stylized and artsy. There's something to be learned in that, by itself, by the way. Always focus on posting photos on Instagram which stand out a bit from the crowd. The more different you can be, the more people will notice your difference. Have an opinion. And I know that's scary. A few years ago I remember writing a Facebook best practices article and one of my main points was "don't be controversial." It's changed, now. So long as you can be confident that the mass majority of your target market shares your opinion (and you don't alienate your own staff) an opinion can be a powerful driver of social media engagement. Converse comes out strongly in support of LGBTQ youth and equality. Their target market shares that support, so engaging with 1) a Converse-wearing influencer who is 2) confidently expressing support for a controversial political issue is a winning combination. But yes, you can do it without Miley Cyrus. Just be careful. 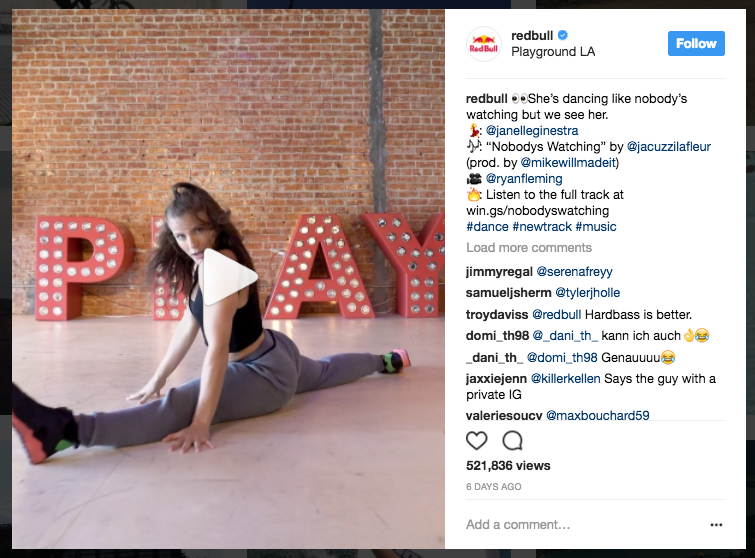 Red Bull's instagram is full of video (which is also a lesson in itself, as video does get an engagement bump by Instagram's organic reach algorithm), but it's a challenge for smaller businesses to continually produce professional quality of your employees doing double backflips on a dirt bike. Even though Red Bull has a significant following on their own, it never hurts to tap the followings of others. It also (handily) comes across as giving credit where credit is due. Janelle Ginestra (the dancer) has 326k Instagram followers; the musician (Jazz Cartier) 50.8k, the producer (Mike Will) 1.6million and the videographer (Ryan Fleming) 31.1k. Those little numbers never hurt. So next time you see a beautiful picture posted on Instagram which relates to your brand, reach out to the photographer or poster to ask if you can use it, and be sure to @mention them. You might be fooled into thinking that a hotel chain can't possibly teach your SaaS, ecommerce brick-and-mortar or B2B business anything marketing, but you'd be wrong. Out of all the Instagram profiles I examined for this article, I was most impressed with Marriott Hotels. Whoever's running their profile should get a bonus. They do it all, from some of the most high-quality images out there, to hashtags, @mentioning, holidays, and all the other best practices we see. 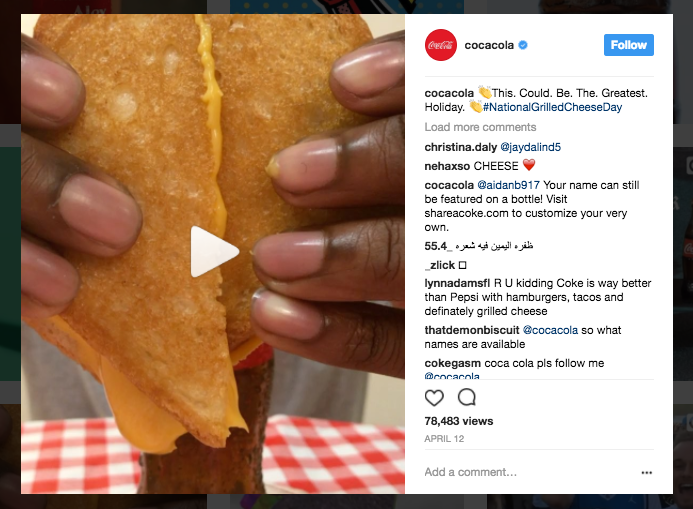 The takeaway from Marriott that you likely haven't heard before is their use of story: "We're in Thailand this week visiting the brand new…" I love the idea of using Instagram to keep your Fans and Followers engaged with what you're business is doing. It allows people to feel involved in the growth and "life" of your business. An actionable strategy for this (for SaaS) would be "We're here at 10pm on a Tuesday. Pizza's just arrived and we're pushing to launch our most requested feature ever. Stay tuned!" An actionable strategy for this (B2C) would be "We're here at our newest office in #Berkeley, unpacking boxes. Swing by for a beer if you're in the area!" Food is trendy, and that's never more apparent than Whole Foods' Instagram profile. Think about it, this grocery store has 300,000 more Instagram followers than the Seahawks. So what can we learn from Amazon's mutli-million-dollar pet project? This photo has it all. I could recommend how to add color to your Instagram photos, or how essential it can be to take a photography course before starting to post. I could talk about hashtags, like Whole Foods' use of "#SundayFunday" (a very popular, general hashtag) alongside more specific hashtags like "#BuddhaBowl" and "Eattherainbow." Or, I could talk about @mentioning your supplier, as Whole Foods did with @edensgreens, to spread the reach and share the love. But my main takeaway for this Instagram post is the question slipped in at the end there: "What are you #mealprepping for next week?" 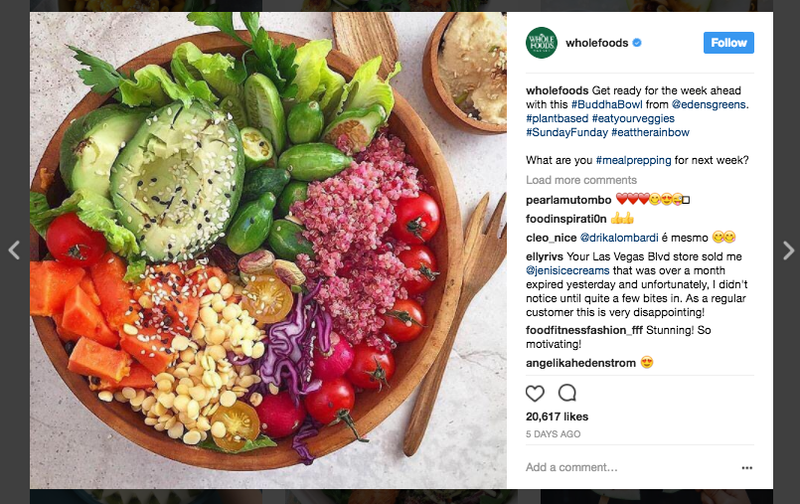 This question doesn't just prompt Instagram users to engage with the post, but it (via the hashtag) gets Whole Foods involved in a larger cultural movement (mealprepping) - an entirely new niche of Whole Foods' target market - health-conscious foodies. 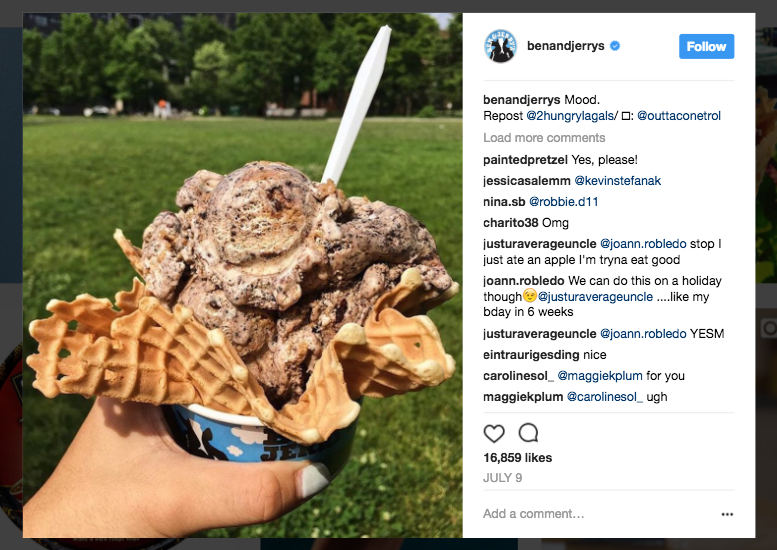 Ben & Jerry's Instagram page makes you hungry. And most of their photos revolve around their product. And wouldn't you, if your product was half as appealing as the 40 or so flavors Ben & Jerry's offers? Posting photos from your customers on Instagram is a fantastic way to show them that you listen, care, and appreciate them. The best way to start geting photos from your customers is to run a photo contest. Offer a grand prize and have your Fans, Followers and customers submit photos (and then share those photos with friends and family) to get a chance to win it. For more on how you can get super-valuable Instagram ammo from your own Fans, check out 47 Tips for Running an Instaram Photo Contest. No, seriously though. Showing off your brand's four-legged friends is a fantastic way to get your Fans to love you that little bit more. Dogs show your brand's fun, easy-going personality. 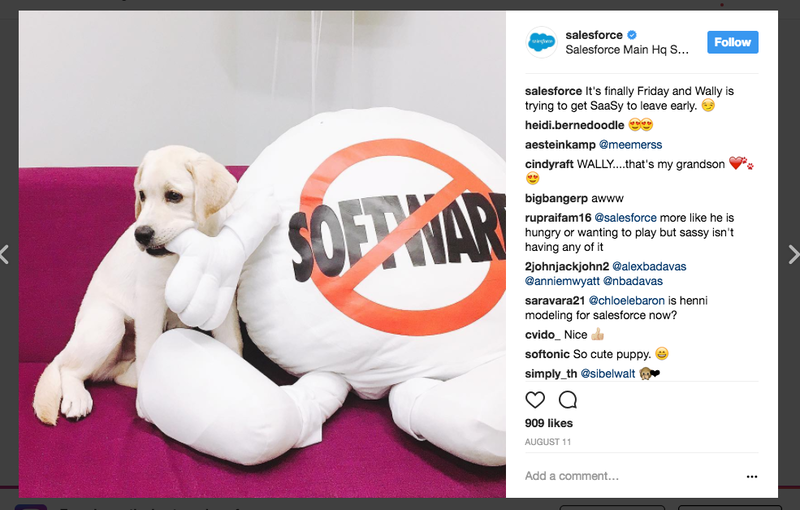 After all, no faceless corporation has ever taken a photo of a puppy biting a "software" pillow. 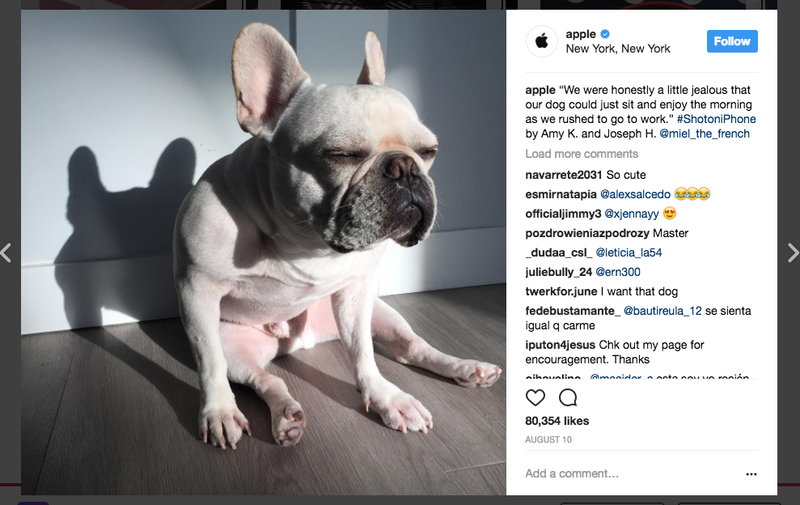 These world-leading Instagram profiles didn't get to where they are based solely on their brand reputation. It takes work, even for Coke and Apple. And the best part about social media is that, 9 times out of 10, the strategies they implement aren't prohibitively expensive or difficult for your business. Social media is about showcasing your business - all the cool things you do and the amazing people who make up your unique brand. 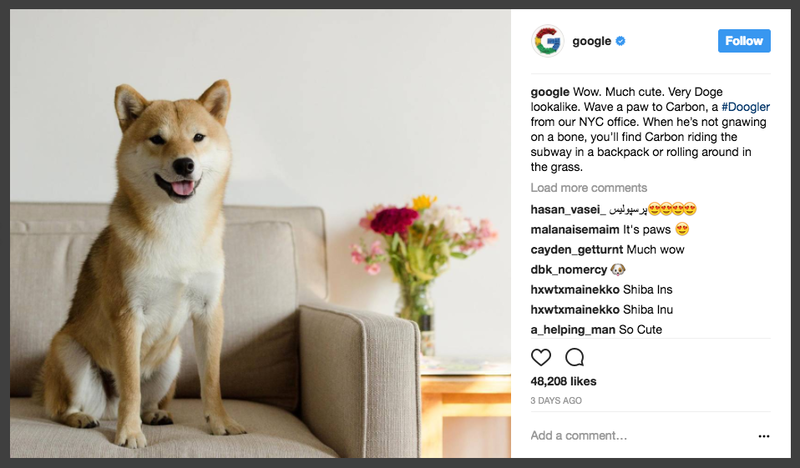 Have these Instagram post examples given you any ideas you want to try? Or, do you have any questions about how these strategies can be put into action? Start the conversation in the comment section below!